Whilton Mill - A team of talented students from Essex won the British Schools Karting Championship (BSKC) 2016 on Saturday in one of the most competitively fought finals in the competition's 10-year history. Matthew Luff (15), Callum Brooks (15) and Iaroslav Kovalev (15), who are all students at The Brentwood School, beat Berwickshire High School and Gordons School B to take the BSKC 2016 crown. An incredibly close competition resulted in a different winner in each race. Silverstone UTC and Gordons School fought their way to the front of the pack in each of the first four races with their A and B teams each scoring a victory. A heavy rain storm soaked the track and conditions were tricky for the next two races which saw victories for Supergreen & Debden B and Dyffryn Taf. The Brentwood School were comfortable winners of Race 7 and looked on course for victory in the final race. However, a thrilling climax to the competition saw Berwickshire High School pull off an amazing overtake at the penultimate corner to take the chequered flag. "The event ran smoothly all throughout the day and the racing was close and competitive with good marshalling. I really enjoyed it" said a happy Callum Brooks from the winning team. Team Captain Lynn Luff commented "It is a fantastic competition with a fantastic standard of driving. A really fun day and great value for money. We were here last year and I have seen an improvement - the prizes are getting better, the organisation is getting better - so we're looking forward to next year and coming back to defend our title." 199 teams entered the championship this year, meaning The Brentwood School beat nearly 600 other students to secure the winning team's prize of a visit to the Dunlop MSA British Touring Car Championship event at Silverstone on 18th September. Here they will enjoy an action packed day as they are guided behind the scenes in both the BTCC and Support Race Paddocks. Second placed team Berwickshire High School included Bradley Cooper (17), Jamie Thorburn (18) and Billy Farmer (17). 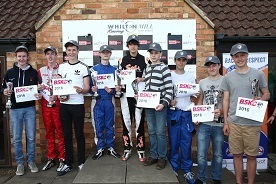 Third place was taken by Gordons School B with drivers Zak Fulk (15), Edward Lee (15) and Pete Given (15). The prize generously donated by Ginetta Cars for the highest placed driver holding a racing licence at the level of Karting National B or higher in either 2014, 2015 or 2016 was won by Matthew Luff of the winning team, The Brentwood School. He wins a free entry into the 2017 Ginetta Junior Scholarship which will see one budding racing driver win a fully funded season in the 2017 Simpson Race Products Ginetta Junior Championship. In a clean sweep on the main awards, The Brentwood School set the fastest lap in the National Final in Race 7 and their driver will enjoy a day at a BTCC event with supergreenracing.com who have been great supporters of BSKC since their driver, Ben Green, was part of the winning team from Debden Park High School in 2014. Will Tew, founder of the BSKC, said: "The skills of the drivers improve year on year and that has been demonstrated at this year's final. The BSKC was started to give young people a chance to experience the thrill and excitement of motorsports, and excitement is certainly what we got in the final." Adrienne Watson, Championship Organiser, remarked: "The winning team members from The Brentwood School should be incredibly proud of themselves. So should all of the teams here at Whilton Mill who fought off stiff opposition to reach the final. We are most grateful to the teachers and parents who gave up their time to mentor their teams all the way through to Whilton Mill. The full results of the 2016 BSKC National Final can be found at www.bskc.co.uk/results/2016/1308. When the starting lights go out at Whilton Mill this weekend, 24 teams will go head-to-head and wheel-to-wheel for the honour of being crowned 2016 British Schools Karting Champions - and the battle promises to be intense. Nearly 600 budding Lewis Hamiltons and Jenson Buttons aged between 13 and 18 signed up to participate in this year's BSKC challenge. A knockout-style series of local and regional heats have whittled down the competition over the last few months so that only the cream of the crop - the fastest young guns around - now remain. The 24 teams - including the champions for the last two years, Debden Park High School - will face off against each other on Saturday (2 July) at the popular Northamptonshire track, Whilton Mill, one of the most demanding circuits in the country and a firm fixture on the British karting calendar. Practice sessions will pave the way to the races and ultimately, the eagerly anticipated coronation of the 2016 BSKC Champions. Whilton Mill will be providing their fleet of new Sodi RT8 arrive-and-drive karts, and each three-strong team will enter six races (two per driver) of which the best five results will count towards the overall score. "The 2016 BSKC National Final contains all the ingredients to be a thriller!" enthused Adrienne Watson, organiser of the British Automobile Racing Club run championship that is now in its tenth successful year. "As ever, the calibre of teams and quality of the racing have been of a tremendously high standard, with some superb battles all around the country. Picking a winner is nigh-on impossible, and it would be no surprise to see the contest go right down to the very last corner of Saturday's last race. One thing is for sure - whoever wins is certainly going to have earned it." The winners of the largest schools karting competition in the UK, the British Schools Karting Championship (BSKC) will be rewarded with an action packed day at the Dunlop MSA British Touring Car Championship event at Silverstone on Sunday 18th September. The prize, organised by the British Automobile Racing Club (BARC), will include a Garage Tour with leading BTCC team Halfords Yuasa Racing and Paddock Tours provided by the F4 British Championship, Ginetta Cars and Renaultsport UK, as well as a behind the scenes tour of the Race Control Building. We are also delighted to announce that the highest placed driver holding a 2016 racing licence at the level of Karting National B or higher (or having held such a licence in 2014 or 2015) will also be rewarded with a fantastic prize generously provided by Ginetta Cars. If the driver concerned was born between 1st January 2001 and 21st March 2003, and they have not competed in an MSA circuit car race, they will be entered into the 2017 Ginetta Junior Scholarship with the chance to win entry into the 2017 Ginetta Junior Championship. If the driver concerned does not meet this criteria then Ginetta Cars will arrange a test session for them in a Ginetta Junior car as an alternative. Great supporters of the BSKC, supergreenracing.com, will once again generously provide a prize for the driver setting the fastest lap. Their driver in this years Ginetta GT4 Supercup Championship, Ben Green, was a member of the victorious team from Debden Park High School in 2014 and hasnt looked back since. The BSKC is open to students aged between 13 and 18 and is a cost effective way for schools to offer karting as a sport as teams do not need their own kart or equipment. 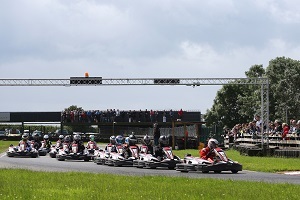 Teams of three can simply arrive-and-drive at one of the participating karting circuits located throughout the country. Registrations for BSKC 2017 are scheduled to open in late-October. To register, schools and racers should visit www.bskc.co.uk/register. Congratulations to all of the students who have qualified to compete at the National Final. Our National Champions for 2016 will be crowned at Whilton Mill on Saturday 2nd July. With all of the Local Finals of the British Schools Karting Championship 2016 now completed, we can look forward to some fierce competition in the Regional Finals as teams attempt to qualify for the National Final. We were pleased to welcome 199 teams to the grid this year and the local kart tracks have commented on some excellent racing and great team spirit. We are now looking forward to the Regional Finals kicking off in April. All of the schools that were victorious at the Regional Final stage last year have qualified again for their Regional Final and we are delighted that a number of teams who are new to BSKC this year have also qualified in their local area. The first Regional Final will take place in Scotland where Erskine Stewarts Melville College are looking to retain their title and this will be followed on the next day with the Northern Regional Final where Whitcliffe Mount, our National Champions back in 2009, will face tough competition in the battle to qualify for the National Final. South Dartmoor Academy, reigning South West Regional Champions, will defend their title at the Thruxton Kart Centre whilst Silverstone UTC have a strong hand with three teams qualified for the Midlands and East event. The fiercest competition could well be at the London and South East Regional Final where The Brentwood School, Regional Final winners last year, go head to head with Debden Park High School, our National Champions in both 2014 and 2015. Good luck to all of the teams taking part! Already qualified for the National Final at Whilton Mill on 2nd July are the teams who were victorious in Northern Ireland. Bangor Grammar School and Belfast Royal Academy both took part in the National Final last year and their participation in the National Final makes it a truly nationwide competition. The first practice evenings have now taken place for BSKC 2016 with further events scheduled in the coming weeks. A limited number of places remain at a few selected venues but time to register is running out so you need to act fast to secure a place for your team. Registrations have been brisk and competition should be fierce to qualify for the Regional Finals that will be held in late April and early May. The competition will culminate with the National Final at Whilton Mill in Northamptonshire on Saturday 2nd July. The 2016 British Schools Karting Championship is now open for teams to register. The local stages of the competition will take place between January and March. Registration will be open until 18 December 2015 but teams are advised to book early to make sure that their place is guaranteed. The BSKC offers students aged 13 to 18 the opportunity to take part in an exciting, nationwide knockout karting competition that does not require previous experience, equipment or substantial expense. As well as the BSKC national champions, regional champions will also be crowned for teams competing in London & South East, South West, Midlands and East of England, North and Scotland. The total cost of entry for the BSKC is £180 for a team of three students (£60 per driver). This includes the use of all equipment, a practice session and entry into the local heats and regional finals if the teams successfully qualify. Discounts are available to establishments entering three teams or more.